Yes, I know, but it had to be done. It was only a matter of time before I was compelled to make this recipe. F/V Northwestern, since you constantly need to fuel up after a long haul, you must have a huge supply of bacon on board. Maybe you want to try enjoying it in an entirely new way? I'm not a bacon consumer. Not because I don't love it (because I do) but it's just so blatantly unhealthy. Bacon doesn't even try to pretend to have any pseudo benefits, it's just in-your-face with it's delicious saltiness. Kind of like that goofy, genuine, perpetually disheveled friend we all know. Their carefree, tell it like it is demeanor may be embarrassing at times, but we still adore them. 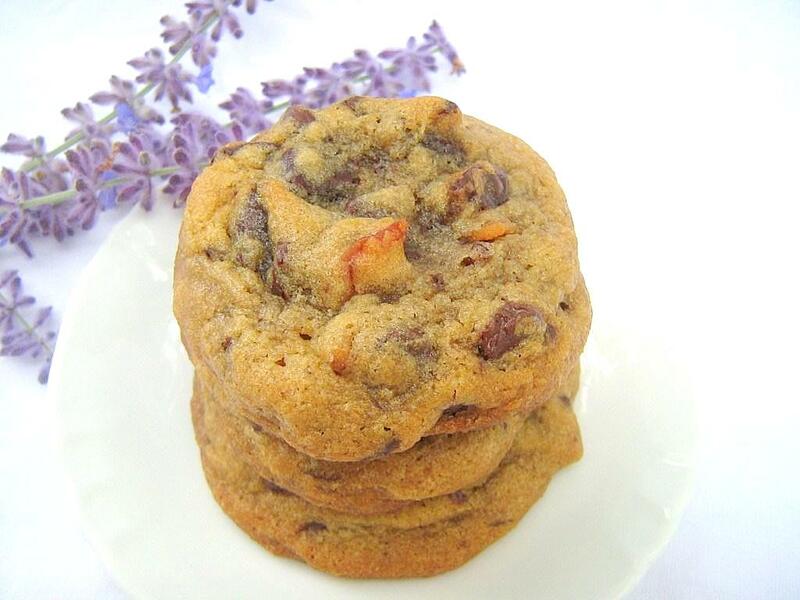 When something as irresistible as bacon collides with an equally irresistible chocolate chip cookie, something magical happens. But maybe magic sounds too ethereal when it comes to describing this recipe. Because there is no mystery or veiled sorcery behind why these cookies are so spectacular and addictive. The combination of sweet, salty, rich, chewy and chocolaty has undeniable appeal. About 2 years ago I took my first bite from a dark chocolate bacon bar and in that instant, I knew I was in love. 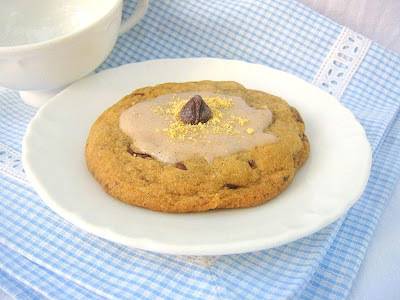 The recipe calls for a maple cinnamon glaze, but I found the cookies to be perfectly enjoyable on their own. Of course if you're already going to the dark side, you might as well immerse yourself completely. I did. Since I don't often buy bacon, I forgot how much it shrinks once it's cooked. The 5 slices required for the recipe retracted far too much, so I made 7 instead. 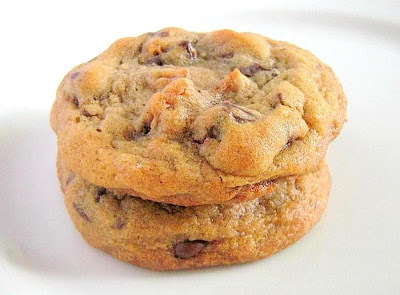 The chocolate chip cookie itself is outstanding, it has all the chewy, thick, chocolate/dough ratio characteristics that I adore. When I presented the cookies to people, I didn't tell them about the bacon. I wanted to see if they could detect the extra ingredient. About 75% of them had no idea that they were actually carnivorous cookies. What they did notice was an extra chewiness with a hint of nut-like saltiness. It was hard for them to pinpoint what was inside the cookies that it impossible to eat less than 3 at a time. The reaction to what was really inside was mixed. Some people took more, and some pretended to look shocked while sneaking in extra bites when they thought no one was looking. Personally I loved these cookies and I was so relieved to find that they didn't last long enough for me to have too many regrets. 3/4 cup (1 1/2 sticks) of Unsalted butter, at room temp. 2 eggs, at room temp. In a large bowl, beat together the butter and sugars until light and fluffy (about 3 minutes). Add the eggs one at a time, beating well after each addition. Add the vanilla and beat to incorporate. In a separate large bowl, whisk together the flour, baking soda, and salt. Add the dry ingredients to the wet in 3 increments, beating just until the streaks of flour disappear. The dough will be soft. If you prefer to have more cake-like cookies, add another 1/4 cup of flour. Using a large rubber spatula, stir in chocolate and crumbled bacon. Remove dough from the refrigerator. For each cookie, measure out about 2 tablespoons of the dough. Roll the dough into balls. Set dough balls about 2 inches apart on a parchment paper-lined cookie sheet. Bake about 10 minutes, or until the cookies just start to turn golden brown. Mix the confectioners sugar, maple syrup, vanilla and cinnamon with just enough cream to make a thick glaze (about 3 tablespoons.) Whisk everything together until the glaze becomes smooth. Your'e so cute, Valerie! I love the way you write. These cookies actually do sound wonderful to me. I have no problem with the idea of bacon and chocolate in terms of my taste buds and such. I'm sure I'd eat three (smile). Maybe four!? I just can't now;). Gosh, I feel like Debbie Downer from Saturday Night Live! sounds incredible! I want to try these! What an interesting way to enjoy it. They sound fantastic. I love anything that has a sweet/salty combination. Awesome! This looks like a fun recipe, because anything is better with bacon. :) Thanks for sharing, Valerie. I have access to some great artisan bacon from a local meat market, so I might have to give this a try! Wow Valerie... This sound intriguing! I love salty and sweet items, but bacon in cookies; No, I wouldn't of put that one together. Now, the maple iced doughnut..yes! You are crazy Valerie, but in a very good way! I'm not a big meat eater, but I cannot resist bacon, so these would be very dangerous for me to have around. And maple and bacon go together like rhubarb and me! I've been wanting to make these for some time. Maybe now that I see how fantastic your look I'll get a round to it. Usually i trust your judgement, but I simply cannot get my head around the bacon element! it must be the conservative Irish in me! I've never heard of bacon and chocolate together. I was doubtful when I saw the title of the recipe, but intrigued when you described the saltiness it brought. Hmmm ... I already use so much butter in my recipes. I wonder about adding bacon to the mix? Sounds very interesting. I am sure my kids would want to dip them in the syrup. Thanks for sharing. I can't imagine the taste with the combination of bacon and chocolate, sounds weird but I think its new to me..I will just give a try to this recipe if I have time. Thanks. HAHAHA.. Ok, I gotta say it. THIS IS MY RECIPE! lol. I'm Muffin, I used to write Never bashful with butter, and I always love seeing all the different version of the bacon cookies around the internets. Oh wow! Bacon, chocolate and maple, a fabulous combination. Love it!! Very good!!! Will be keeping this one! The only issue with this was that the recipe simply did not call for enough bacon. If you didn't crumble it enough, the bacon bits were few and far apart. I would use equal parts chocolate chips and bacon. :D GO BACON! love salty and sweet items, but bacon in cookies; No, I wouldn't of put that one together. Now, the maple iced doughnut. Yipee!